Allergic rhinitis and chronic sinusitis are both types of chronic nasal/sinus congestion. They are classified slightly differently based on their cause but are closely related. Allergic Rhinitis – Commonly called hay fever, it is caused by environmental allergens or irritants. This could be something outdoors like grass, trees, pollen, and mold, or something indoors like animal dander, mold, certain food or medicines, industrial chemicals, and dust mites. The inhalation of an allergen causes the body’s immune system to react. The body releases antibodies (most commonly immunoglobulin E or IgE) that attach to mast cells (responsible for releasing histamine), causing the release of multiple chemicals (1) that cause symptoms such as nasal congestion, postnasal drainage, nasal itching, sneezing, and itchy or watery eyes (2). Chronic Sinusitis – Classified as an inflammation of the sinus lining that is either acute or chronic, sinusitis is caused by nasal polyps, a deviated septum, respiratory tract infections, or as a complication of another medical condition (immune system related diseases such as cystic fibrosis, gastroesophageal reflux, or HIV). It can also be caused by of allergic rhinitis. Many of the symptoms of chronic sinusitis are similar to allergic rhinitis, and may also include headaches, yellow discharge, ear pain/pressure/fullness(3). Allergic rhinitis and sinusitis are often linked, because allergic rhinitis causes your nose to become blocked, which can then block the sinuses and cause sinusitis(4). In fact, sinusitis rarely occurs without concurrent rhinitis. Seeing a doctor to determine if you have allergic rhinitis or sinusitis is necessary before Western treatment can be prescribed. A physical exam and allergy testing are performed for suspected allergic rhinitis while chronic sinusitis and its underlying cause require nasal endoscopy (a fibre-optic light inserted into the nose) or CT/MRI scans to show physical problems in the nasal passages or sinuses. Acute sinusitis usually subsides without any need for specific treatment. Other Western medical treatment options are summarized in the table below. How can Traditional Chinese Medicine and Acupuncture treat allergic rhinitis & chronic sinusitis? Traditional Chinese medicine views nose-related symptoms as a branch of an internal problem with the body’s organs that are out of balance and not functioning properly. Specifically, the health of the nose is related to the health of the lungs, which is the organ most easily affected by external pathogens like allergens and bacteria, and usually the first organ affected when we catch a cold or experience allergies. Other internal organ imbalances can contribute to cases of allergic rhinitis or chronic sinusitis and your TCM practitioner will ask questions to determine where in the body the problem has originated. This allows them to both relieve your immediate symptoms and deal with the underlying cause simultaneously. Because the body weakens while dealing with any chronic problem the earlier treatment begins the sooner allergic rhinitis or sinusitis can be resolved, improving your quality of life and reducing the need for long-term medication use. 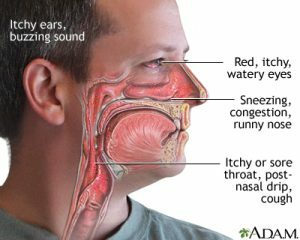 How can Acupuncture help treat allergic rhinitis & chronic sinusitis? Once the root of your allergic rhinitis or chronic sinusitis has been determined, an acupuncture treatment will aim to correct the flow of energy in the body to target the underlying cause. This approach will not only relieve nasal symptoms, but will also prevent them from returning. The first and most immediate effect that acupuncture has is of opening the nose, reducing congestion and relieving any pain or pressure in the sinuses. In many cases, people experience a significant reduction in such symptoms after the first treatment. The most recent research has demonstrated that acupuncture is effective in the treatment of rhinitis and may even have more benefit compared with antihistamines (although more research is necessary) (5). Another study from 2005 compared standard Western medications for chronic sinusitis (antihistamines, corticosteroids, decongestants, and saline rinse) with TCM acupuncture treatment. This study found that the difference in symptoms after 4 and 12 weeks was almost the same between these two groups, showing that acupuncture can be just as effective in the treatment of chronic sinusitis as the standard prescribed medications (6). An acupuncture treatment will use both distal points on the limbs, hands, and feet as well as local points on the face and around the nose. For acute cases, receiving 2-3 treatments per week for at least 2 weeks is the most effective. For chronic cases, 2 treatments per week for at least 5 weeks is necessary. Whether you have acute nasal congestion from a cold or a more serious nasal problems, seeing a TCM Practitioner as soon as possible will significantly reduce your recovery time and help you get back to normal life. If you or a loved one are experiencing allergic rhinitis or chronic sinusitis symptoms, please do not hesitate to contact us to find out if/how Acupuncture and Traditional Chinese Medicine can benefit you.